This Academy Award winning film about the American Air Corps, available in a tinted print,is nothing if not authentic. 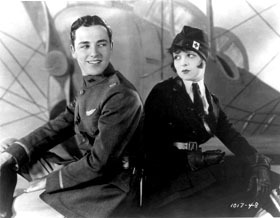 Director William Wellman was a pilot during World War I, and and he ensured the aerial sequences were completely convincing; all scenes with the actors flying were shot in the air, with cameras mounted on planes. He produced a magnificent action film with death-defying dog-fights and huge battle scenes, yet at its core a tragic theme, the loss of friendship.